Well hello there! I've been busy finishing up the painting in our master bedroom and am thrilled to tell you I'm finally done! I started this redo two and a half years ago and I'm determined to finish it up this year. Gah. It's taken me forever. I've dragged my feet because as with many, I don't focus on this room as much because we're usually the only ones to see it. And I didn't hate the old look or anything, so I haven't been in any rush. And oh yeah, the ceilings go to about 14 feet tall in this room. I painted them nearly 12 years ago for the first time and still remember how scary that was, so I've put this off mainly because of that. But I got it done! People. I painted the first wall in the summer of 2013. Nearly three years later and I finally finished it up. I'm SO HAPPY to get this done. And the bonus -- I absolutely love the new color. 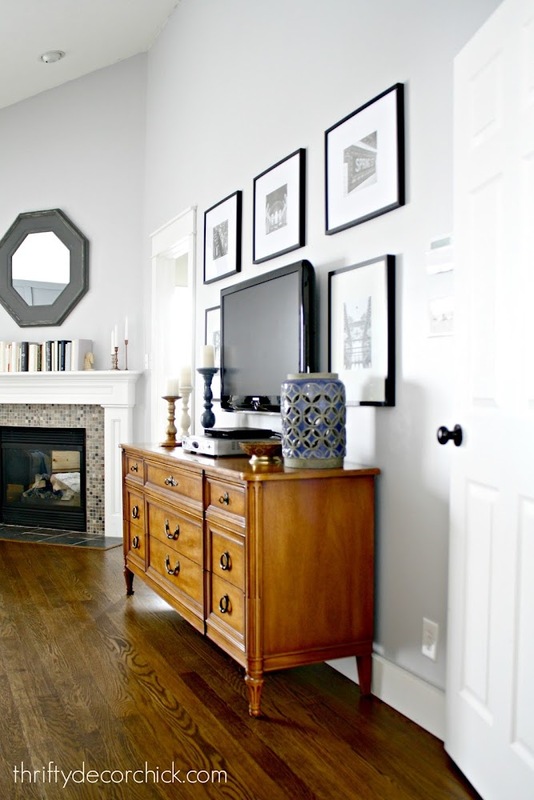 It's completely transformed the look of this room. You can see what a mess it was. That's a lot of hanging and rehanging right there -- up till recently I had something up there that hid all of that. You know how you build something up in your head for a long time and avoid it because in your head it's a huge, massive, scary project? Well this took about four hours total -- and that's with two coats! It wasn't bad at all. I used our extending paint pole and only had to get on the ladder for the tippy top. The cutting in was sweat-inducing but I was fine. I had my husband listen for any loud thuds though, no lie. As you can see, I taped off the size of the TV on the floor and then figured out my layout and distances there. With most gallery walls I go a lot less structured so I'll just put the holes in the wall and move frames around if needed. With this symmetrical look and a freshly painted wall I wanted to be more precise. 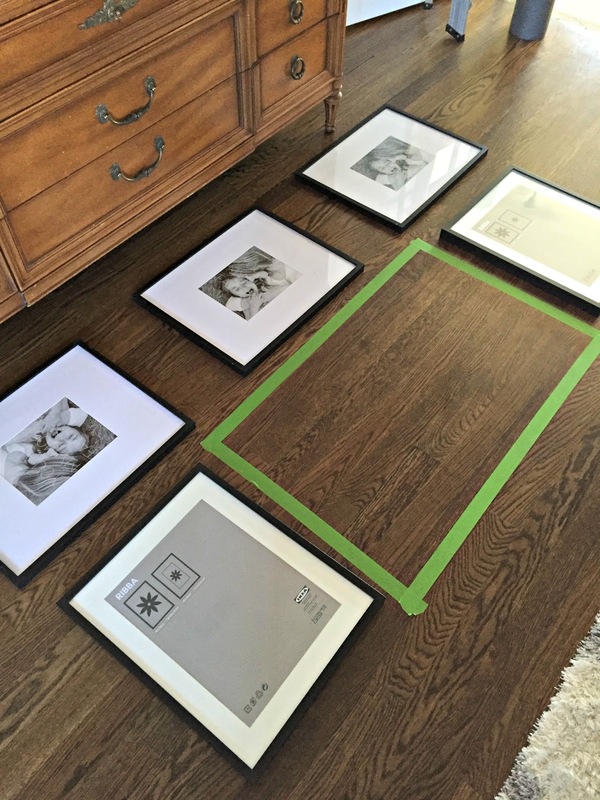 The mats for the IKEA frames were too big -- they needed 11x14 photos (that I can't print at home). So I used my method of "matting" photos I shared here. The only poster board I have is an off white color that doesn't match the upper frames and it's driving me batty. That's one thing I'll change as soon as this no spend month is over. (I even tried painting them.) Craft stores have nicer, bright white poster board that looks much better. I love how it makes the beautiful hardware pop! 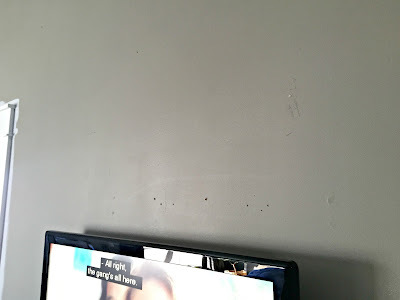 I couldn't find a before photo of this wall from the past few years anywhere! I never took pictures of it because it was just a dresser and TV. So I don't have any great before and afters pics, which you know makes me sad. :) I'll have to do some more digging. Three years later, I'm just excited to not have different colored walls in here anymore. You can see the changes over the years with the dark gray accent wall behind the bed, the first wall I completed with a mini makeover (using stuff from the house) here and the latest wall I finished up a couple of weeks ago with new art here. It's coming together so well, just as it did in my head all those three years ago. :) As I mentioned earlier this month, my word for the year is FINISH -- I'm determined to get this room done in the next couple of months! By the way, this Whitestone color is a perfect light gray. I highly recommend it. It doesn't have any blue or purple undertones like some have and it still gives nice contrast against the white trim. Looks awesome!! 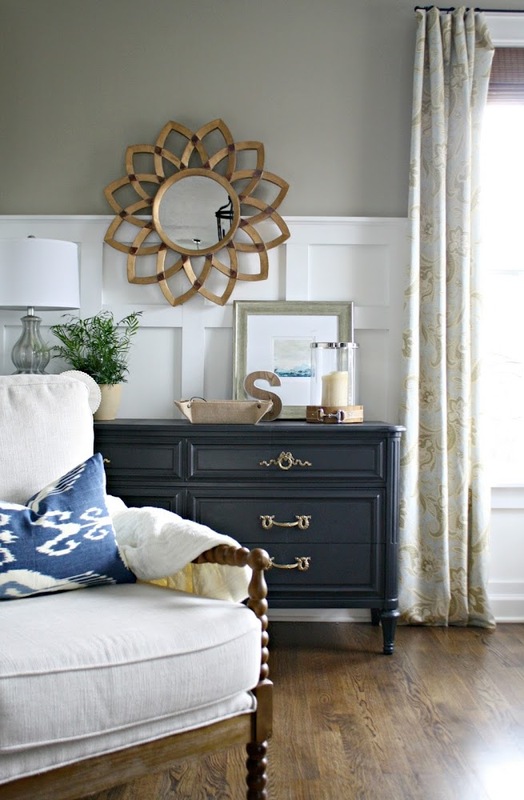 I love the new color and I think the dresser painted a dark color will make it seriously pop! (although I was also going to suggest a mint green too) Great work and the gallery wall just finishes everything off so nicely. Looks very nice and bright! How do you hide your TV cables? 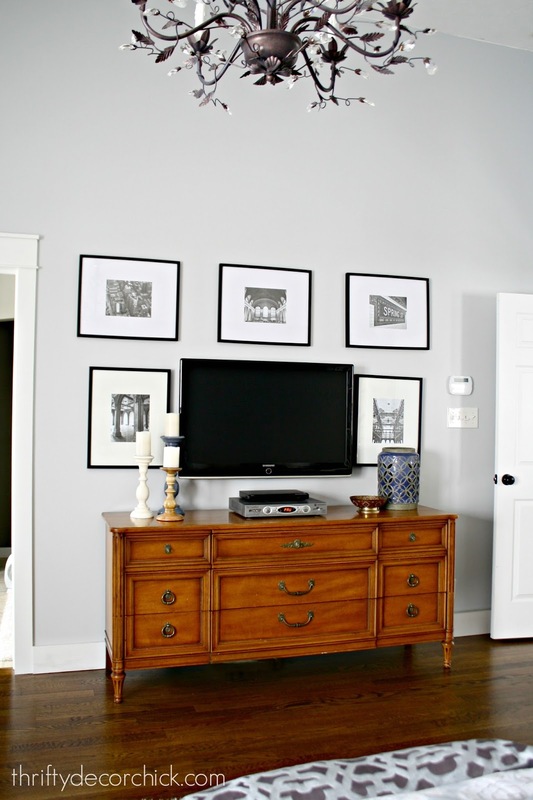 My TV's aren't mounted as we are rentiing but would like to hang in my next home. Do you have to have power and cable run to the wall behind the TV? Thanks. The color looks great on your walls nice and bright! Regarding the cream colored "mat" I've used spray paint to get a mat I used in a frame and just painted it the color I wanted. It worked great! Also where did you get your bedroom chair, I swore you've mentioned it before. I just cant seem to find the post. Love how it turned out. 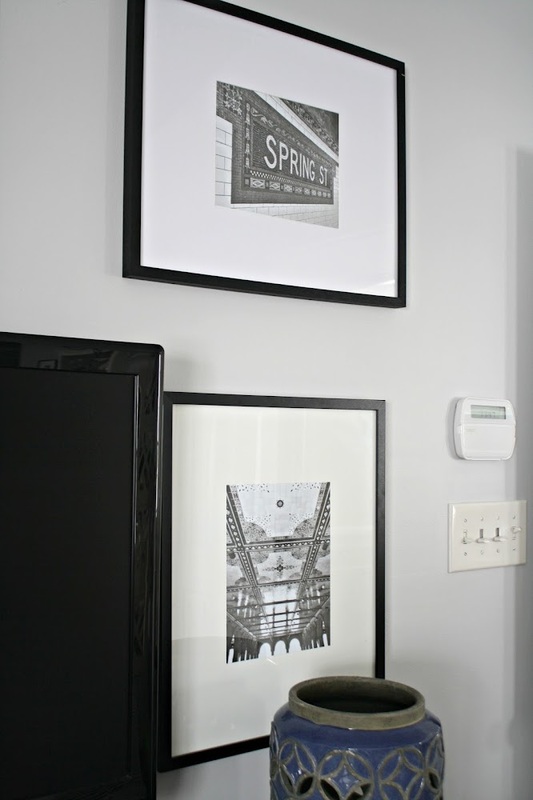 I need to do something similar on our tv wall. The new wall looks terrific! I know what you mean about projects getting scarier the longer they are put off. I have one right now that I keep going back to every so often and it has been really hard to get back to it since I had to stop before the holidays. I love this! By the way can you please explain why you mixed BM paint with Sherwin William? I've been hearing other people doing this but no one has explain their reason for doing this. Are they both the same color? Thanks! She means she had a Benjamin Moore color (from a BMW color deck) mare in a Sherwin Williams product. So the base she used was SW, but the color formula is BM. I work in a BM paint Store and I'm wondering what she likes better about SW paint over BM? Coverage? Ease of application? Just curious. Woah! Typos much? Not BMW, just BM. And also, made, not mare. 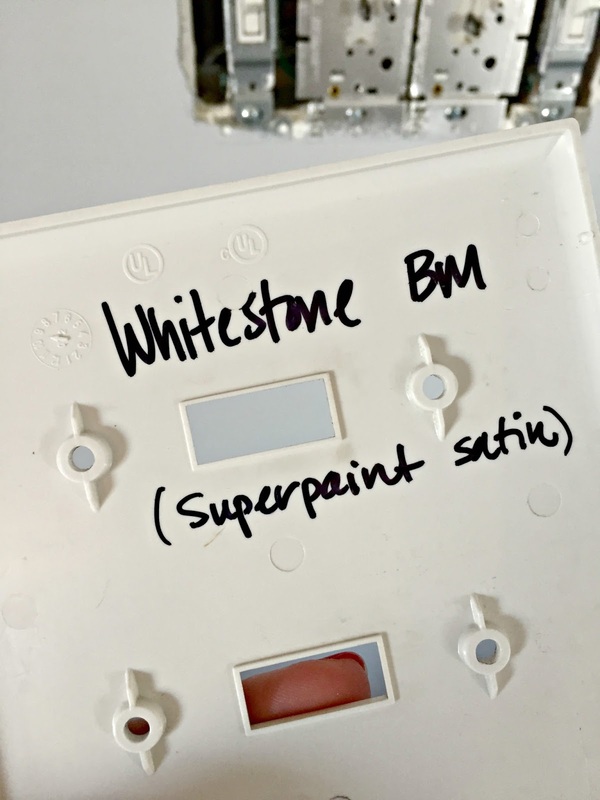 I also forgot to clarify that two colors weren't mixed together, one formula from BM in a SW paint base. Oh my! 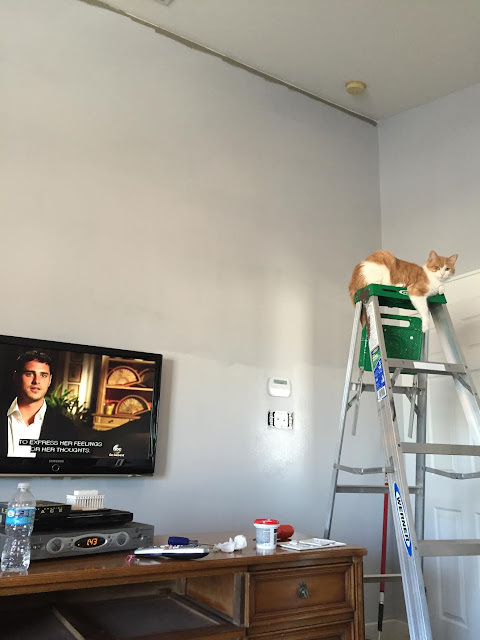 I have a ladder like yours with a cat on it!!! Teeheehee! One tip I have always heard about decorating, or even cleaning your house, is to do the master bedroom first. That way you will have a relaxing place to retreat to at night when you have all the other rooms to deal with. Awesome, congratulations! It's amazing to finish something three years in the making. And it looks fantastic! Try the dollar store for white posterboard, ours is 2 sheets for $1.00! I use the same trick to mat all of my photos. 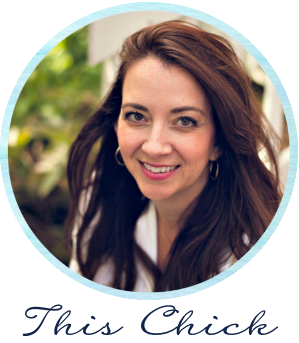 Love your blog, I've been reading it for years. Your peppercorn fireplace inspired us to make ours over and I love it! What an amazing change and I love it! Will check out Whitestone as I am looking for a lighter gray. I love how your kittys are always in the pics. HA!! What a great idea to put the color of the paint on the back of the light switch... I'd never seen that before. Looks great! I have used the trick of purchasing a sample of paint in the room color and I put a label on it with where all it was used. It comes in handy when I get scrapes or need to fill nail holes. And go for the darker blue console. 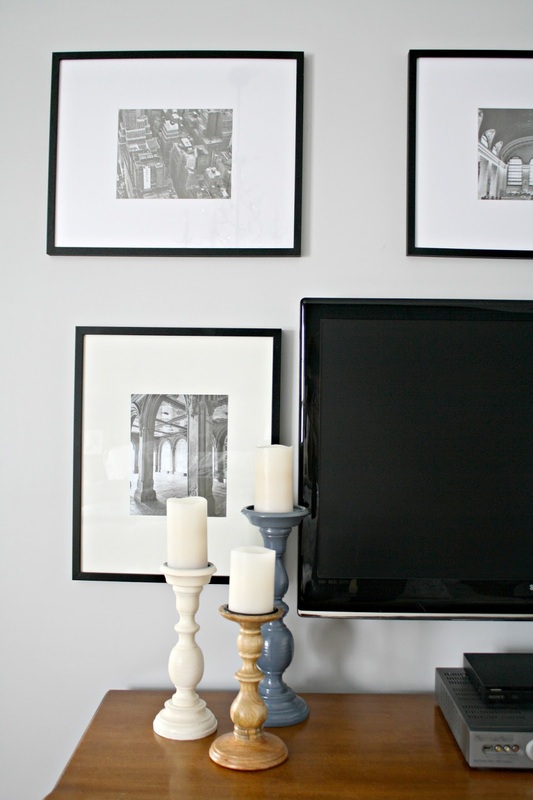 I love navy pieces against a gray wall! Ahhhh it looks fabulous!!! Great job! I would NOT have been able to do the cutting in around the ceiling at that height....I would have been shaking like a leaf!! Good on you for finishing up and for sticking with the program. Love your assistant overlooking your work!! How about adding the date you painted to the back of the switchplate cover? Might be helpful to the paint store if you ever need more, as well as to yourself. You know how time flies!!! Yaaay! I'm so excited for you. Great job. The B&W photos look great around the TV. I think I'll do that! Great color! Congrats on tackling that daunting paint job. You're finished!! About the Ikea mats, I turn mine over and they're white instead of cream. It all looks just wonderful! Yes! I noticed that (love IKEA!) but the mats were for 11x14 and our printer doesn't print that big so I had to make my own. Thank you! I love the new look! But to be honest I would've placed the bottom two frames so that their outer edges line up with the upper frames' outer edges... now they seem a bit too close to the TV. Another reader suggested that and I've already moved them out! I love this! I'm wanting to hang the tv in our bedroom, and my husband has the long/short dresser that will make that work, but I needed an idea to round it out. Try changing out your light bulbs first. Take a look at TDC's recent bath post to see how lighting can really impact paint color. Love your living room---looks so welcoming! I was wondering where you purchased the round coffee table? I love it and am looking for something to replace my square one!